Burrows & Co was a small, short-lived glove manufacturing company of the early 20th century. 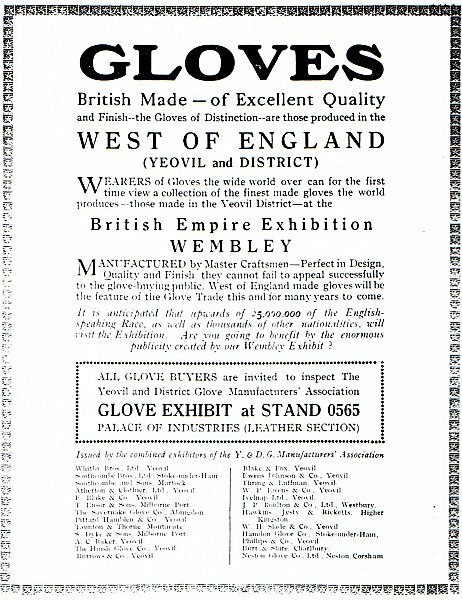 They are known to have been active in 1924 but were only listed twice in Yeovil's trade directories and these were in Kelly's Directory of 1935, in which they were listed as glove manufacturers of 42 Goldcroft, and in Edwin Snell's Yeovil Directory of 1954. Despite their 30-plus years existence, nothing further is known at this time. If anyone has further information please contact me - see my contact details below. Full credit will be given. A full page advertisement from the June 1924 edition of "The Glover" listing those local companies taking part in the British Empire Exhibition at Wembley - including Burrows & Co.